Our Gift Box contains one dozen cookies. 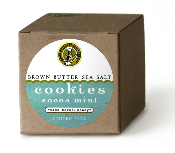 The gluten free Cocoa Mint Brown Butter Sea Salt cookies are made with Cup4Cup gluten free flour. We use Scharffen Berger cocoa powder and just the right amount of peppermint extract. Enjoy! Allergy Information: Our baking facility uses tree nuts, peanut butter, soy, dairy, wheat and eggs on shared equipment. Please visit our Cookie Facts page for more information and list of ingredients.